Drinks & Supper with the artists Wednesday 23rd September, see below for more details - or contact the gallery. Fiona and Ian have now delivered their paintings to the gallery - very exciting indeed! Ian Shearman's paintings are full of detail, you really can see the waves running off the sands, he captures that lovely shimmer of glassy water on the beach. 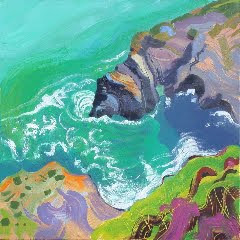 Ian has visited Cornwall several times this summer to paint. An area that he loves and hopes to make his home very soon. Ian knows the coast line of Cornwall intimately, having painted there for many years, this collection of work brings you just a little bit of the English coastline which we think you will love. 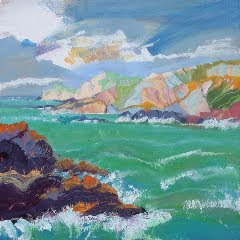 Fiona has enjoyed her switch from painting landscapes to seascapes and is loving the many turquoises of the sea. 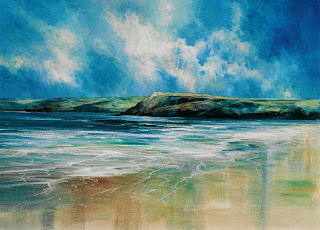 Her strong, bold brush work combined with vivid colour are extremely effective when depicting the rugged coastline of Devon & Cornwall - the sun is shining, the wind is blowing and the surf is up! Bright and breezy! There are sereval preparatory sketches, always interesting to see how and artist starts. 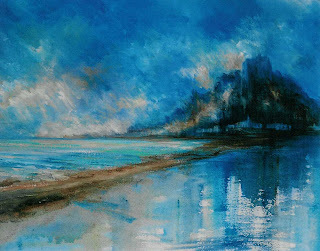 The sketches are light watercolours with scribbles pastel and pencil. Don't think they'll be available for too long! We're not having a private view for this show - we're asking you to join us for Drinks & Supper! Supper is at Number Seven Restaurant, Cheltenham - Main Course followed by pudding, coffee & a glass of wine, all in honour of our coastal theme. The cost of supper and a glass of wine is £19.00 per person. Drinks at the gallery are of course free, so come to the gallery early for drinks - and of course to view the paintings.